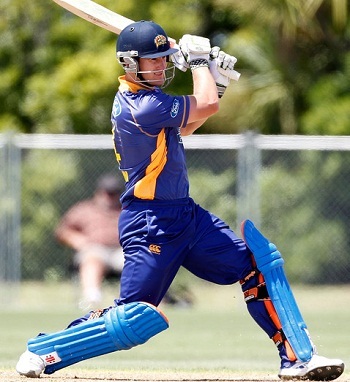 Otago 4-242 (Neil Broom 117*, Ryan ten Doeschate 66, Derek de Boorder 45, Joel Paris 2-50) beat Perth Scorchers 5-180 (Hilton Cartwright 69*, Adam Voges 36, Ian Butler 3-47) by 62 runs. The star opener of Otago, Neil Broom, along with Ryan ten Doeschate punctured the bowling of Perth Scorchers who suffered a big defeat in CL T20, at Jaipur. Otago blasted 242 runs after losing four mere wickets in the allotted 20 overs and Perth Scorchers were restricted to 180 with six wickets remaining. 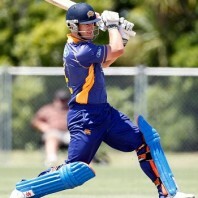 Neil Broom (Otago) was declared ‘Player of the match’ for his unbeaten express innings of 117 from just 56 deliveries. The 8th match of the Champions League Twenty20, Group A was held on Wednesday, September 25, 2013, at Sawai Mansingh Stadium, Jaipur. Earlier, Simon Katich, the skipper of Perth Scorchers, won the toss and offered the batting to Otago. The decision looked wise as Joel Paris struck twice in the third over and removed two top order batsmen at 9 runs. Derek de Boorder, got in next as Neil Broom hit two back to back fours in the fifth over. The first followed with 4 fours in the coming couple of overs and hit the first six of the innings in the 9th over. The partnership was disconnected at 76 after 9.5 overs when Boorder was clean bowled by Adam Voges for 45 off 28 balls with 2 sixes and 5 fours. He was replaced by Ryan ten Doeschate who preferred to attack from the word go. The batsmen added 23 runs in the 12th over with 2 sixes and 1 four while Broom went past his fifty in the next one. He hit three successive fours two overs later and the boundaries were sprinkling from the blades of the duo. Ryan ten Doeschate attained his 17th Twenty20 half century in the 17th over and accumulated 16 runs on the first three balls of the next over with 2 smart sixes and 1 four. He was finally gone for 66 off just 26 with 6 towering sixes and 3 fours. Neil Broom plundered his maiden Twenty20 hundred with 3 giant sixes in the 19th over and remained unbeaten for 117 off 56 deliveries with 8 cracking sixes and 9 fours. Otago piled up a huge total of 242 with six wickets in hand at the end of the 20th over. Joel Paris was the most successful bowler with two whereas Jason Behrendorff and Adam Voges held one wicket each. Perth Scorchers started the chase by surrendering three wickets for just 11 runs in 1.3 overs. Adam Voges and Hilton Cartwright got off for recovery and the latter hit 2 fours in the fourth over. Voges registered 5 fours until the end of the 10th over and became the next victim at 76 for 36 off 27 balls with 5 fours. Ashton Turner appeared in the park next as Cartwright hit 1 six and 1 four in the 13th over. They took the score to 127 in 15.2 overs when turner was caught and bowled by Butler for 27. Tom Triffitt took guards next and scored 10 runs straight away with 1 six and 1 four and Cartwright completed his first Twenty20 fifty in the 16th over. Perth Scorchers required another 102 runs to win the game on the last 24 balls which was a real difficult task. Hilton Cartwright held his end for 69 off 53 with 2 lofty sixes and 6 fours, Triffitt was at the other end at 25 as their team reached 5-180 in 20 overs. Ian Butler was the highest wicket taker with three and Nathan McCullum ended up with one. Otago won the match against Perth Scorchers comprehensively by a vast margin of 62 runs and secured 4 points.